POP shadows are a bit hit and miss with me. This is because their textures are so inconsistent from palette to palette. I like the Smoky Eye Palette, and the Pretty Puzzle palettes, but not some of the others. The small little trio in “No. 3 Park Avenue” is great though. The neutral combination of opalescent pink, rich taupe, and black is flattering and easy to wear. 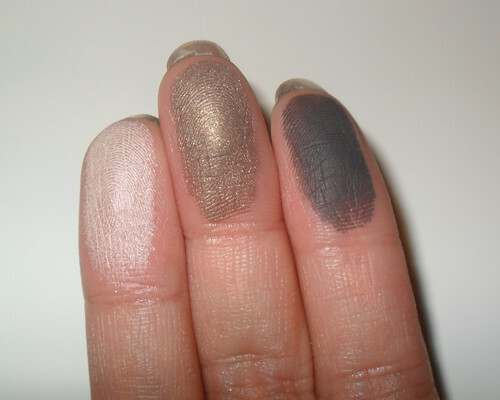 The highlight/allover color (right) tends to look a little chalky so you might want to avoid it if you have darker skin, but the eyelid color in the middle is a perfect metallic taupe/mocha. The liner shade (left) is also very pigmented and easy to work with. 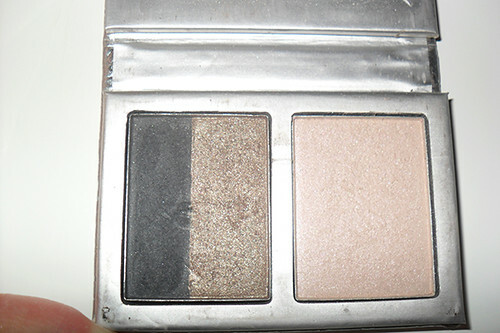 The shadow initially comes with “lid”, “brow” and “line” stamped on the corresponding shades, but mine has worn off with use. Above are the three shades in one single swipe. As you can see, the pink tends to come off as off-white most of the time, and since I’m not for over-highlighting the brow-bone (i.e. too pale and unlike my skin), thats the only bad point about this palette to me. Otherwise, most POP palettes are good value for money, and pretty good quality. Texture-wise, this is grainier and less fine-grained than MAC, and with a proper primer underneath, it’s always lasted me a full 8 hours without much obvious fading.